I hope everyone had a wonderful Thanksgiving and you are getting into the holiday spirit. I have our tree and decorations up and have been overdosing on Hallmark Christmas movies. Are you ready for Christmas yet? If you need gift ideas, click on the banner above. Mr. G and I took a few days off to visit Madison, GA where we enjoyed looking at beautiful Antebellum homes in this small town which is part of the Antebellum Tour in western Georgia. Located a bit south of Athens with all the southern charm you would ever want to see. We were hoping the trees were turning, but we were a couple weeks early for that. We recently went on another antebellum home tour in the same area. 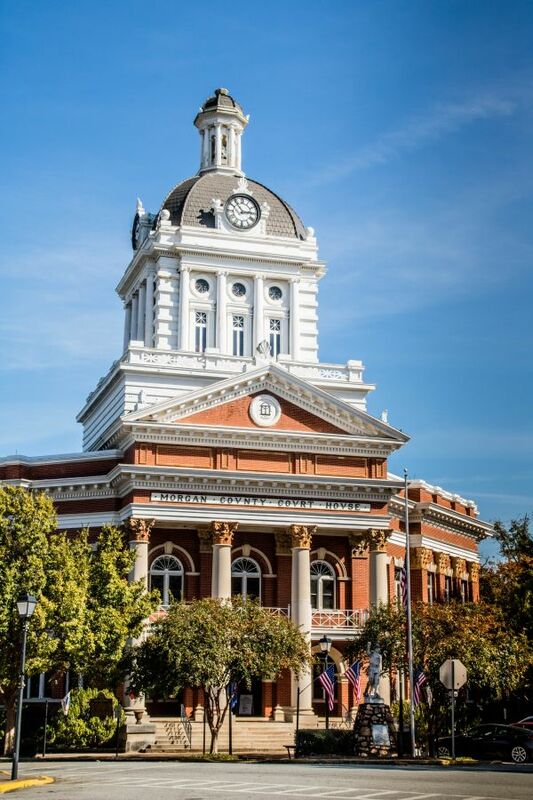 The picture above is the courthouse in Madison. So beautiful! If you are looking for a good burger to eat, go to the Madison Chophouse Grille. Oh my! The area is known for their Angus beef farms and these burgers were the best I have ever eaten. So juicy and so much flavor. If you are looking for good southern BBQ? Try Big Kev’s BBQ right off the town square. I love that part of the building is an old train caboose. I think my pulled pork is pretty good, but theirs was so tender it just melts in your mouth. Be sure to check out Madison’s website for tons of things to do in the area. The best time to visit is in the fall or around Christmas time with all their home tours. 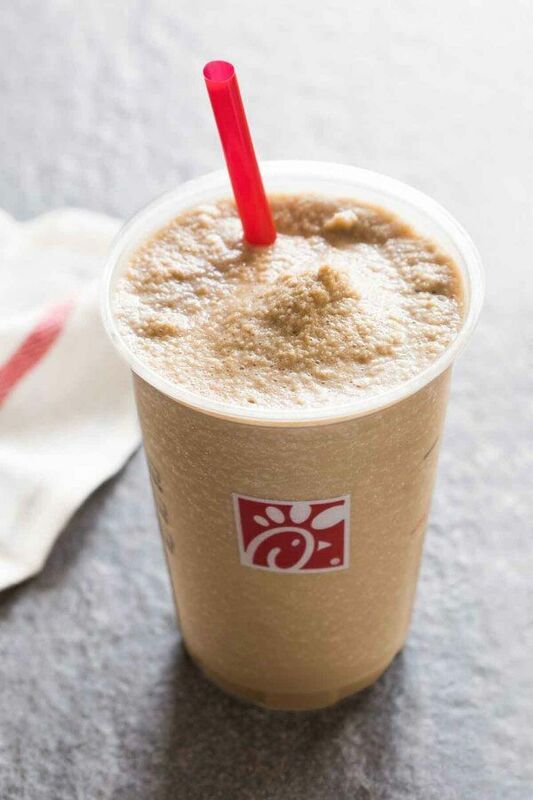 Is anyone else hooked on Chick-Fil-A’s Frosted Coffee as much as I am? I have to force myself not to get these so much. Since I basically only drink water all day and not having caffeine in my system, this drink will cause me to run around at 90 miles an hour! And talk even faster!! It is habit forming but oh so good for less than 300 calories. It is really my guilty pleasure right now. Oh and if you like to frequent Chick-Fil-A, get their app. It’s so easy to order ahead and pay for your meal before you even get there. Our local branch has curbside service where you park and they bring you your meal. But, most of the time, I will use the app and go through the drive-thru. I have found the most productive item for my kitchen and I know this will make a great gift for someone on your list. Its called an Instant Pot Cheat Sheet. 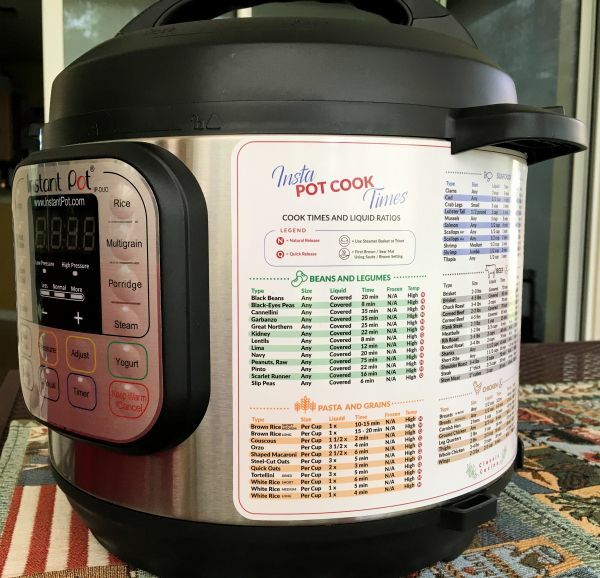 It’s a magnet which fits right on the side of your Instant Pot that gives you all the functions for so many different items you cook in the Instant Pot. You can see how perfectly it fits on my IP. Every time I use my IP, I look at that cheat sheet. Be sure to stop by and check out all the Christmas crafts, lists, gift ideas and more. That instant pot cheat sheet looks like it would come in very handy. Think I want one. Good to get away and enjoy something different and unwind. Yup, since Thanksgiving is over, I am ready for Christmas. I have taken out all the decor. I love that Instant Pot Cheat sheet! I JUST ordered that Instant Pot Cheat Sheet! I love my Instant Pot and this is perfect for me given I’m using it more and more. I love this! It’s like a slice of life read. It was really good. I’m so glad you’re a rambler. It’s fun! Well, yeah! That magnet is adorable and something a cook in your life would certainly want. Thanks for sharing that unique idea! I have still not jumped on the Instant Pot bandwagon. I need to, though, after all the good things that I have heard about it. I still have to make it to Georgia to visit. It look s so beautiful. I also have not tried Chick-A Lil yet, either. It is now on my list of places to eat. I haven’t tried Chick-fil-A’s frosted coffee yet. It looks pretty good to me, though. Love the Instant Pot Cheat sheet. It looks like it really comes in handy… I haven’t tried the coffee version. Love the lemonade flavor though. Ok I need to check out the insta pot cheat sheet, that sounds like something ever instapot owner should have to hand! What a fab idea. Madison, Georgia looks like a great place. I’ve been to Georgia, but haven’t really visited many spots. I will have to check out Madison. Thanks. Mmm, Chick fil A have the best shakes. Whenever I’m in an area with one, I stop by and I always get a shake and nuggets of course. I haven’t tried the chickfila coffee yet. That looks delicious!! And I NEED that cheat sheet in my life. thank you for sharing. Thankfully, not having a Chick-Fil-A makes it easy to not get hooked… But I do miss Chick-Fil-A. I’ve never been to a Chik Fil A – we don’t have one near us. But that coffee looks amazing! I haven’t tried the instant pot yet, but I have heard a lot of good things about it. I never had Chick-Fil-A’s frosted coffee but they seem so tasty! I’ll have to order one next time I go. Mmm…I need to try one of those Chick-fil-A drinks! They look yummy. That courthouse in Madison is gorgeous! I’ve ordered that Instant Pot Cheat Sheet! I love my Instant Pot and this sounds great!